Do you know which city was the capital of Spain, before Madrid? Is your answer among these famous cities of Spain – Barcelona, Seville or Valencia? Disappointment. It is Toledo. Have you visited the place? Toledo served as the capital of Spain, before Madrid became the capital of Spain in 1563. A medieval walled city where three cultures flourished – Christians, Jews and Arabs – is the beautiful, charming town of Toledo, 74 km south of Madrid. Historic city is declared as the world heritage site by UNESCO. Once you start walking on the cobbled-stoned, winding, labyrinthine streets of Toledo, you will realize why this is such an important cultural landmark on the map of Spain. Toledo sits majestically like a pearl on a hill overlooking the Tajo River. River kisses the old city on its three sides, and the fourth side is embraced by the medieval walls. Best way to experience Toledo is by walking. It is not a big place and hence, you can walk the entire old city. There is a high probability to get lost (literally lost) in the maze of streets, sometimes climbing up the streets and at times, descending down with the splendid view of the town. I would strongly recommend you not to locate yourself by looking constantly at the map or your GPS because it is pleasure and an experience to be lost, sometimes. (Read about another postcard city – Guanajuato (Mexico) where you MUST get lost!) Let me give you an important traveling tip here. A descending street generally takes you away from the city center – Plaza de Zocodover – either towards the River Tajo or the walled side of the old city. And when you are catching up on your breath, trying to climb up the streets, there is a high likelihood of ending up at city center Plaza de Zocodover, the highest point of the old city. Famous Alcazar is close by. In its earlier avatar, it was a fortress but now has been renovated to Spain’s official military museum, Museo del Ejercito. 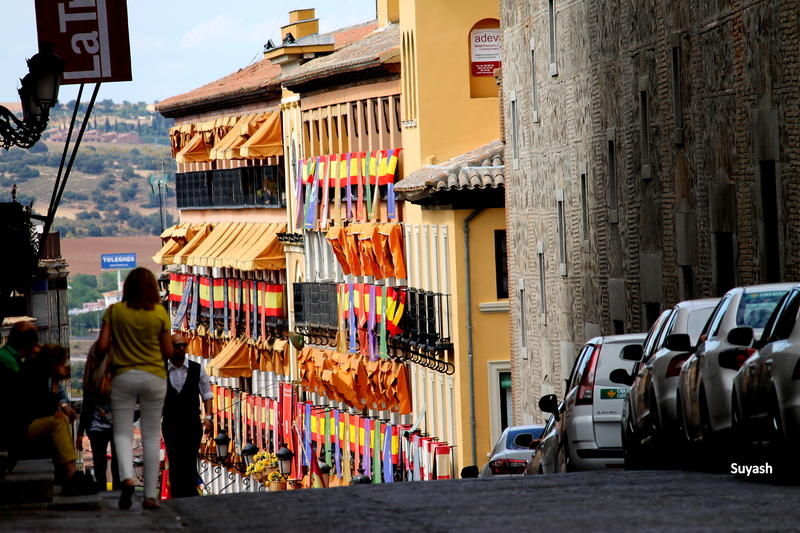 The above photograph was shot in the Plaza de Zocodover, with streets descending down, embracing the colorful Toledo. More photos of descent here. I will cover more details and photos of this experience, called Toledo, in further posts. So, keep reading 🙂 Read about Alcazar and the famous Cathedral of Toledo here. How to Reach Toledo: Once in Madrid, catch a bus at Plaza Elíptica bus station which takes you to Toledo in around 1 hour 30 minutes. However, the faster way (though not the cheapest one) to reach Toledo in 33 minutes is by high speed AVE trains from Puerta de Atocha station. You can book your tickets online in advance which cost within 22 Euros. There are number of trains traveling in both directions and hence, Toledo is considered to be on a day-trip itinerary. However, i would recommend you to stay in Toledo and enjoy the smallness of a city and the magnanimity of cultures. After reaching Toledo train station, hop on to the city bus number 5 or 6, which takes you to the city center, Plaza de Zocodover, in less than a Euro. Have you visited Toledo? Do tell us about your experiences in Toledo. Would you be interested to know more about this enchanting historic city? My spain trip was not a tourist trip but a business trip to attend SEPG conference. Read about my experience of the conference here. Also read about another culturally rich place – Bali. This entry was posted in Art & Culture, Spain, Travel and tagged Alcazar Spain, AVE Renfe Train, Guanajuato Mexico, Madrid, Mazapan, Museo del Ejercito, Plaza de Zocodover, Santo Tome Confiteria, Spain, Spain Military Museum, Tajo River, Toledo, Toledo Spain, Travel, Walking form of Meditation. Bookmark the permalink. Looks like an amazing place for photography, right? Hehehe 🙂 Glad my post triggered thoughts and remembrances within you. Thanks for dropping by my post, Zee. Enjoy…!!! I really enjoyed the reading. Thanks !. True, walking is the best way to see a place, a few years ago we had been to Sofia and Istanbul, we just walked and walked and had a great time. Thanks for this post, hope we will be able to go there some time. How true. I have heard Istanbul is a great city. Not much aware of Sofia, The Bulgarian capital city. Hope to see them some day. I had no idea that it used to be the capitol. Thanks for the history lesson and a wonderful photo. Even I was so unaware till I was there. Its really a beautiful, small laid back city with picturesque landscape. Will soon publish more photos and details. The colors in the photo are amazing. It looks like some good exercise can be found in Toledo with walking the hills!